The trailhead sign for Pass Mountain says “Mountain Bikes not recommended”…just what I like to see…less riders on the trail more technical action…Pass mountain proves to be a sweet ride. Yes, it is technically challenging, but just enough to remind me I’m not superman. I’ve ridden this trail clockwise from the Crismon gate as well as counter clockwise to the saddle (almost) then back down. Counterclockwise is a brutal climb. Clockwise is easier on the lungs and legs, not easy, just less hard. Park on the southwest corner of Crismon and McKellips, pay the 1 dollar ride-in fee at the access gate and you’re set to go. You can also drive in at the main entrance and pay the $6.00 fee. It’s your money. A lesser known access point is off Usery Pass Road. A short mile climb through a sandy wash puts you right on the Pass Mountain trail. See the TOPO. This access point is on the Tonto Forest side so there is no ride-in fee, but you sure pay for it in sweat — pushing up the sandy wash. This is my favorite access point and acts as a connector from Wild Horse, which leads to Twisted Sister and the Hawes Trail System. 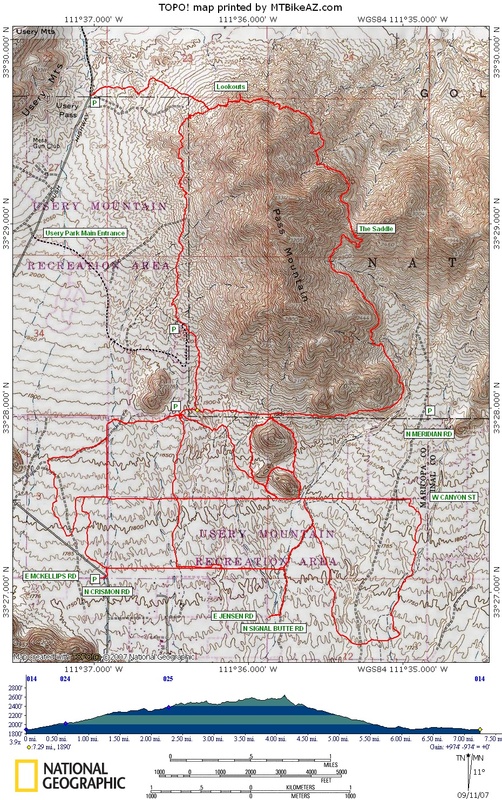 The Usery Mountain Regional Park trails are all pretty flat, with the exception of Pass Mountain and Cats Peaks. It’s a good place to take your friends who are just beginning to ride. MTBR Forum Review of Pass Mountain posted in the Pass Mtn. Loop thread. Rode it today! Pretty tight and techy. A lot of fun and beautiful scenery! Trail takes longer than it looks so get an early start because it is pretty slow going, hike and bike a few spots. Ended up riding the last hour in the dark! Rode it on a new enduro 29er and needed the travel and could have used a few degrees slacker in the head. Not a good trail for full on XC bikes. Didn’t love this trail like everyone else seems to. Great hike with small chances to ride a bike. The scenery is beautiful on the backside of the mountain, that’s about it. I am by no means a beginner on a bike, I love biking National trail at South Mountain but this made me feel like a moron. Lots of loose, bowling-ball sized rocks to throw you off an already difficult line. I would not recommend Pass Mountain unless you are a seasoned rider. Great trails for beginner to intermediate riders are Hawes, Gold Canyon, and Desert Classic at South Mountain. Looking to go on some rides I just got a new bike anyone down to show me a few trails? ?? I’ve ridden this both ways…clockwise today…not as brutal but definitely technical and tight climb and white knuckle downhill. I think ill be heading out that direction this week or next. thanks for the review! ill post my thoughts after i ride. Good friend of mine and I rode the trail 1-31-09. Even though you pay the price during the initial uphill its worth every drop of sweat once you get to the back side of the mountain and bomb the killer downhill. Lots of hikers, clockwise is recommended, where your gear and there is no question that it can be dangerous for beginners. Road Pass Mtn for the first time last weekend, and I gotta say it was a total hoot. The climb up didn’t hurt to bad, and for the decent I was sure glad I put on my armor.